There are so many different versions of houses for your dogs, ranging from comfort to utility. Choosing one doesn’t have to be tricky, though! That’s why we’ve put together this list of the best dog houses. We’ve tried to include different houses that might fit your dogs’ needs, whatever they may be. Before we start, here are some things you should look for when you are shopping for a dog house. Material: What is the dog house made of? The most popular material that your dog’s new hideaway can be made of are wood and plastic, each with their own benefits and drawbacks. Choose your favorite material for your dog’s house. 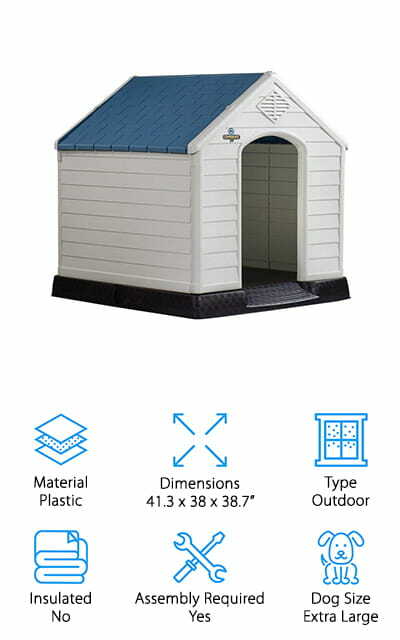 Dimensions: The dimensions of the dog house can tell you what size dog will fit inside, as well as where it’s going to go in your backyard or in your home. It’s important to know if the house is big enough. Type: The houses on this list are meant for either indoor or outdoor use, with some that can be used for both. Know where you want to place the dog house before you make a purchase. Insulated: Insulated dog houses will make your dog more comfortable on colder days. If your dog is going to be using their home outside during the winter, insulation is definitely a trait you should look for. Assembly Required: Most of the dog houses on this list require some level of assembly, but not all of them require tools or expertise. Make sure you have what you’re going to need to set your dog house up. Dog Size: What size dog is the house made for? This is really important if you want your larger dog to fit inside, or want to give your medium or small-sized dog a cozier environment. Take this into account! Now we can start showing you all of the dog houses! No matter what size your dog is or what season they need their dog house for, there is something on this list for your pup. We’ve done all the research and review to make sure that you’re getting the best dog house available. Check out our top pick and budget pick first before you move on to the rest of the list. 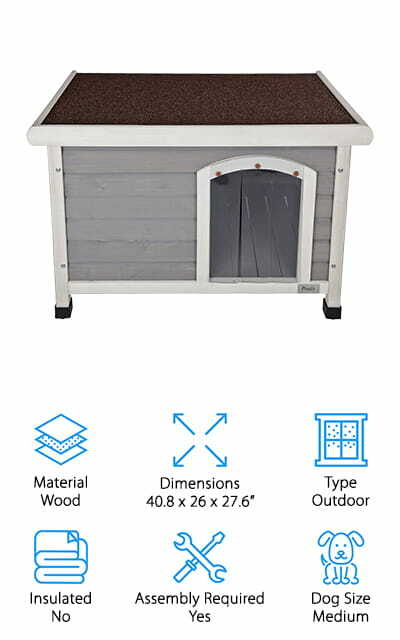 Our choice for the best outdoor dog house is this one from Petsfit. It’s made of natural cedar wood and it’s packed with a ton of features to make your pup more comfortable. You can open up the roof in order to clean it, and the floor on the bottom can be taken out as well in order to get it perfectly clean. It’s weatherproof, so you can be comfortable with your dog being out in whatever weather conditions are happening outside. In the rain, snow, and even sun, this house will provide a nice respite. It’s easy to assemble, as all of the holes are pre-drilled. You don’t need any power tools to get it up set up. It comes with a door flap to make sure that it stays warm in the winter and that your pup is comfortable. 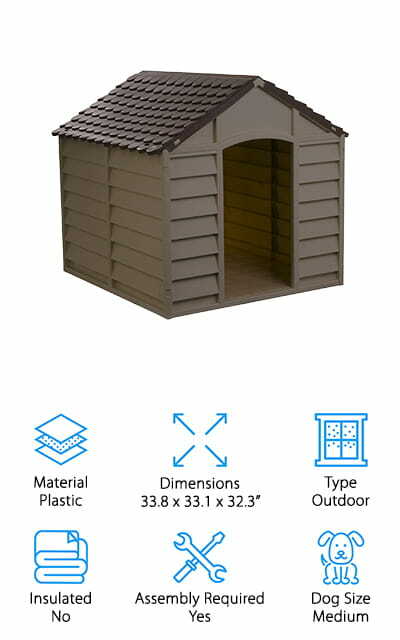 This dog house is painted a nice neutral grey color and is of course painted with water-based paint for safety. The Aspen PetBarn 3 is a great insulated dog house for smaller dogs. It’s got an all-plastic construction that will last a long time. It’s durable and reliable and has the added benefit of helping to prevent fleas. This is one of the best little dog houses, meant for extra small breeds. It includes a rear ventilation system that helps keep pets comfortable with fresh air all year round. The weather protection includes an extended roof guard and a raised floor to keep your dog dry in the rain. This channels water off the roof as well as making sure it doesn’t run up into the dog house. There are three larger sizes meant to accommodate the breeds of all sizes, up to a maximum of 90 pounds with the largest house. Where this dog house shines is in assembly – you simply have to snap the pieces together, with no tools required! Your dog (or cat) will love it! This house by Confidence is made of a durable, weather-proof plastic that will give your dog a cozy place to hang out on his own. It has a ton of room for its size so that your extra-large breeds will fit quite comfortably. 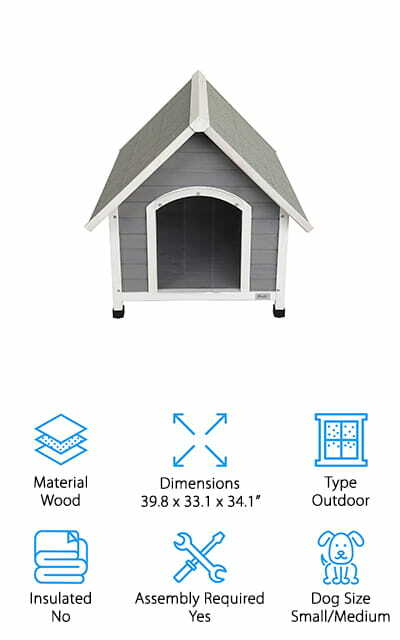 Of course, it’s always a good idea to know the measurements of your pup before buying a dog house, that way you know they’re going to fit inside. The size of this house makes it one of the best dog houses on our list for larger dog breeds. It’s easy to create a comfortable home for your pup that they can enjoy in all different weather conditions. It’s easy to assemble with only simple tools, and you’re going to love the way that it looks in your backyard. Your dog is definitely going to love having his own little home to relax in. There are also smaller options for your smaller furry friends. The best indoor dog house on our list is this one by Best Pet Supplies. It’s made of comfortable fleece material with foam and stuffing in order to give your furry friend a comfortable place to lounge around the house. This house is made for smaller dogs and can even be used for cats. They will look amazing in your home, no matter where you want to put it. One of the best parts about this dog bed is the fact that you can throw it in the washing machine when it gets dirty, something that the plastic and wood houses can’t match. It’s also portable, so your dog can be comfortable when you go on trips or on vacations. Despite the fact that it’s a soft house, it’s not going to fold or fall in on you when you need it most. It’s a durable, stable house that you and your furry friend will both love. The Petmate Igloo is a heavy-duty plastic construction that your dog is going to love resting in year-round. It’s one of the best insulated dog houses for cold weather that we could find. It has raised floors to keep your dog off of the cold ground. The side moats help drain off any rain or other liquids, keeping your pet dry and comfortable in your house. You can snap it together right out of the box without the use of any tools, and your dog will love it! It has an offset doorway to keep rain and wind where it belongs, as well as a roof ventilation system to allow your pup to stay cool when it’s warm outside. The plastic doesn’t allow bacteria to grow, and won’t allow fleas to take hold as other materials would. 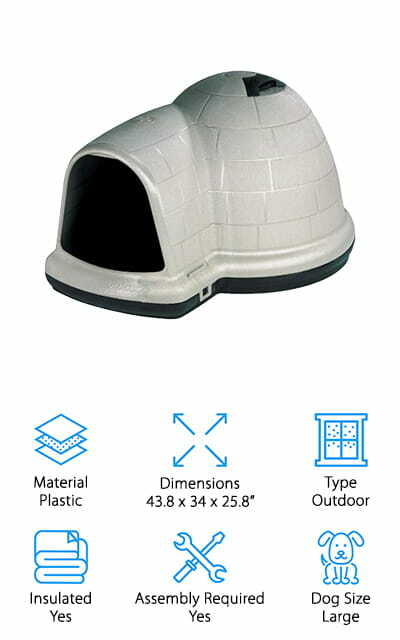 You can also buy additional accessories to customize your Petmate Igloo Dog House. It’s one of the best houses available right now! 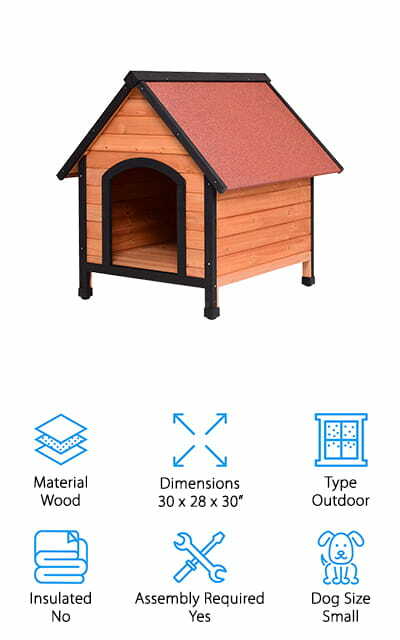 Merry Pet’s dog house is a solid wood construction made from kiln-dried cedar and stained with a natural color to create a pleasing look for your backyard. This particular house is meant for smaller dogs, and you can use it both indoors and indoors. In addition to being the best insulated dog house on our list, it’s easy to assemble with the included hardware. It includes side steps, a balcony, and latticework to make your dog feel like a king or queen. The roof and the bottom panels are all removable so you can clean it easily. 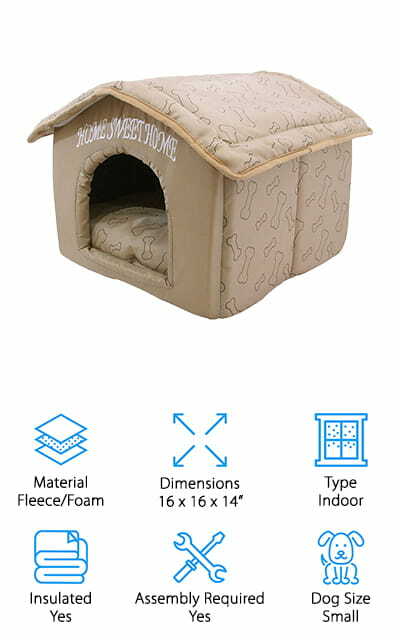 They also offer versions of an indoor dog house for large dogs, so make sure that you look into it if you have a larger breed. The wood can withstand bouts of humidity and more extreme temperatures and weather, so it’s durable if you choose to use it outside. It’s up to you how you use this neat bed! If you’re looking for a somewhat simple home for your furry friends, this might just be your best dog house ever. The Starplast Mocha is a plastic dog house that assembles quickly and easily so your pup can start enjoying it. It’s completely free of rust because it includes no components that would rust. It’s made of a UV-stabilized plastic that won’t break down after exposure to the sun. It’s weather-proof in all aspects and easy to clean. We love how easy it to put this house together, with no additional tools or hassle. And when it’s done, you can move it around however you’d like because it’s lightweight. 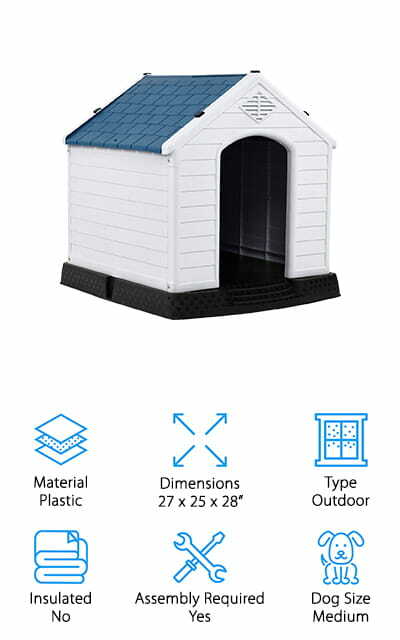 All of the features that go into this dog house makes it an amazing alternative to the regular house you might find at the supermarket while still maintaining a simplistic design and effect. We know that you and your favorite furry friend are going to love this dog bed! 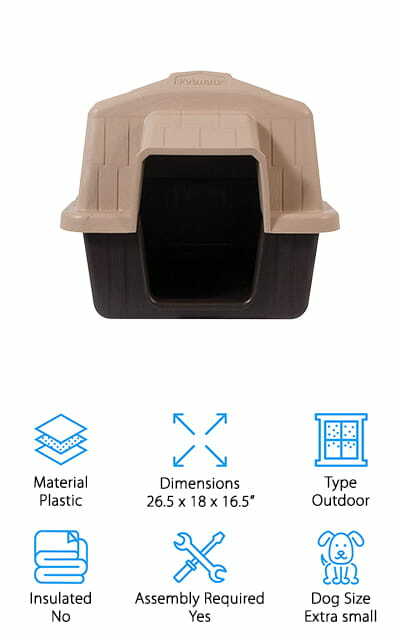 The Giantex dog house is made of a sturdy plastic that is going to last your dog for a long time. This particular house is meant for medium-sized dog breeds like retrievers. It’s a comfortable space for your dog to relax in, with an elevated bottom to keep them dry and to keep dirt out of their sleeping area. The vents at the top of the house are meant to stabilize the temperature inside, making it the best dog house for hot weather on our list. This increased airflow balances out any excess heat or lingering cold in the winter, giving you the best option for your dog for all seasons. You can take the roof off when you want to clean it, and when you need to clean the interior of the house without wanting to crawl inside it. The plastic won’t corrode and will resist any type of weather, from the sun to snow and pouring rain. Tangkula makes one of the best dog houses for cold weather that we could find with this wooden house. It’s got plenty of room for small dogs to lounge. It has a reddish brown design that will look great in your backyard or garden. The roof is made of asphalt, rain resistant and great for keeping your dog warm and dry. The floor is raised to prevent moisture from seeping into the doghouse and making your pet uncomfortable. It is made of fir wood, and the insulating properties of the wood make it one of the best dog houses for cold weather – especially if your winters are warmer than most. The outside is painted with a water-based paint that is safe for your dogs. It’s easy to put together, and there are only a few tools needed. The best part is, they are included with the house so you will have everything you need. 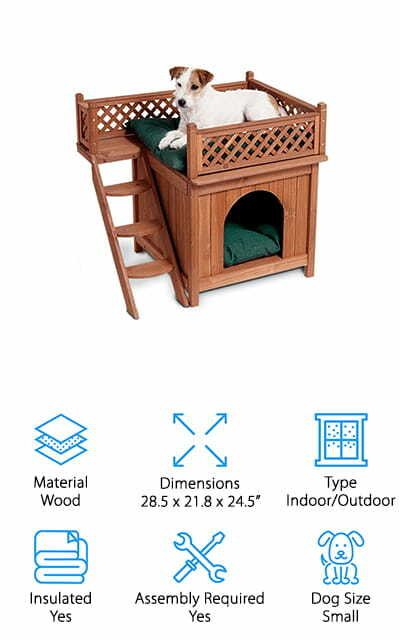 This Petsfit Wooden dog house can easily be paired with the best dog house heater that you can find to make a cozy winter home for your dog. It’s sized to be the perfect companion for small or medium-sized dogs and includes a door flap so that your pet has a comfortable, private environment. It’s grey on the outside, with a water-based paint that is safe for your dogs and the environment. The slanted roof makes sure that rain slides right off, and it’s reinforced with asphalt to make sure that no rain gets inside to make your dog’s home uncomfortable. This is a nice house that you can easily make into a warm little oasis for your dog in the winter months. Plus, the natural cedar wood smell will smell amazing to the both of you! It even has plastic feet that you can adjust to keep the house off of the ground. That’s amazing!